Washington (CNN) - It's every twentysomething's worst nightmare: a pre-family dinner phone call from mom and dad punctuated by the ever-ominous sounding, "We have something really important to talk to you about." But Organizing for Action, the political advocacy group closely aligned with President Barack Obama's agenda, is trying to flip nightmares about difficult conversations over pot roast and mashed potatoes on its head to support the Affordable Care Act. The group, formed from the grassroots wing of the President's re-election campaign, launched its "Health Care for the Holidays" campaign early Friday morning, debuting a website - Barackobama.com/talk - dedicated to spurring conversations about how to enroll in the federal and state health care exchanges and an internet video that parodies the sometimes difficult conversations between parents and their children. 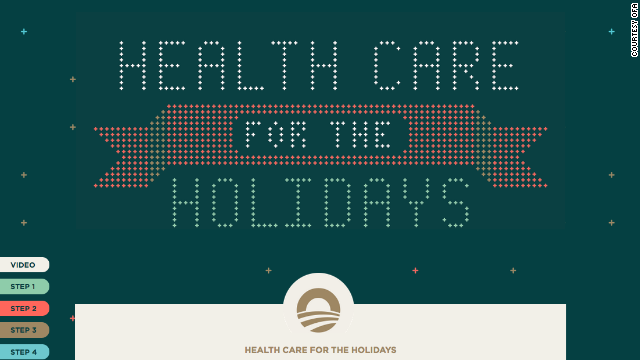 Watch the "Health Care for the Holidays" web video. With the tagline, "having the conversation is easier than you imagined," the campaign borrows a constant theme from Obama's successful 2012 re-election bid: recruiting through person-to-person contact. "The Healthcare of the Holidays campaign encourages family, friends and neighbors to have the one-on-one conversations that are crucial to getting people enrolled," Katie Hogan, a spokeswoman for OFA, said. While OFA has already spent the past few months educating potential enrollees about the resources required to join the new marketplaces, the website condenses the information into a paint-by-numbers guide to signing up. The site includes tips on how to have a conversation about healthcare with a loved one - like several suggested responses for common questions about the law - as well as a downloadable sign-up checklist. The page even has a social networking component of sorts, allowing users to share their own stories and tips for how they helped their family members enroll. The campaign features a dedicated webpage that includes tips on how to have a conversation about healthcare with a loved one, as well as a downloadable healthcare sign-up checklist. OFA also released a web video as part of Healthcare for the Holidays and will continue to provide digital materials to promote the campaign. But the site also displays some promises bound to rile up a public that already feels largely jilted by the exchanges' rollout. The website meshes with the President's oft-repeated promise that subscribers who liked their insurance plans could keep their plans, vowing "you can find a plan that fits your budget." While the site touts financial assistance and subsidies for eligible applicants, it could do little to combat anecdotal evidence from across the country showing some Americans being dropped from their lower priced health care plans because they do not meet the minimum requirements under the new law. The effort also promises to deliver digital treats, like the YouTube video that premiered to coincide with the website's launch. Entitled, "Get ready to have the talk," the video, soundtracked to sleigh bells and low humming trombones, focuses on one man's anxiety over a conversation with his parents. The video deploys a faux stream on consciousness, showing several different iterations of the conversation. Scenarios fraught over include his parents moving in with him, his parents joining a cult; his parents knowing what he did last summer and his parents getting matching tattoos. OFA also paraded its pop culture bona fides. In one version of the conversation, the fictitious parents proclaim, "We're Daft Punk," the masked French electro-pop band rarely seen in public. In another, the dad stares menacingly into the camera before parroting Breaking Bad character Walter White. "I am the one who knocks," the actor says. What about Hanukkah and Kwanzaa ? This christmas stuffer best choice: Ted Cruz and his father. Is it just me, or does this sound more like a cult indoctrination? Obamacare in your stocking? Sorry I rather have the lump of coal. Young people think they are invincible but they are so wrong. Right now they are covered under their parents insurance plan thanks to Obamacare until they are 26 years old. My nephew had a scare with cancer when he was only 21 years old. His parents have some money so he didn't have to worry about insurance but if he had not had parents that could have afford his treatment he would have died. If this were to happen now he would have been covered by insurance plan. If we could promise a war with Syria that would cost hundreds of billions of dollars, would republicans be happy enough to stop doing things that hurt the American People?